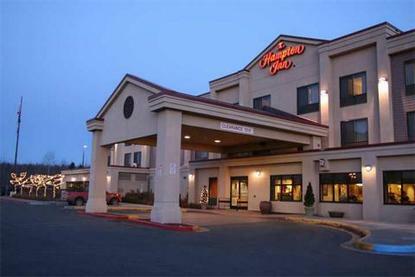 Hampton Inn Anchorage is located at Tudor Road and ''C'' Street in midtown Anchorage, within five minutes of downtown and Anchorage International Airport. Area attractions include a 16-screen theatre with stadium-style seating, a vintage aircraft museum, zoo, and mall with 170 shops. Within .1 mile you can dine at Applebee's, Peppermill, Red Robin's, or Sea Galley. We feature 101 guest rooms, including 4 deluxe Jacuzzi rooms, complimentary high speed internet access (both wired and wireless) complimentary 24-hour shuttle service to Anchorage International Airport, exercise gym, and indoor pool and whirlpool. Amenities include complimentary continental breakfast, in-room coffee maker, hair dryer, iron, microwave, refrigerator and per-per-view movies/games. We also offer laundry/valet services, guest laundromat, meeting/banquet facilities, and audio visual equipment are available for a nominal fee.